Weekend rack mounted to the tailgate and supported mostly with the bumper. The structure is fixed to the car with 6 straps. The rack can be used to carry up to 3 bikes. Bikes carried on this rack may cover the rear lights and registration plate. 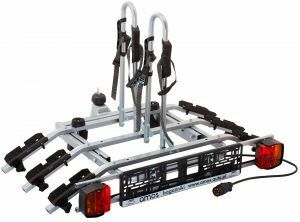 The rack is available directly from the manufacturer (no mail-order sale) for the price (gross price – for the set). The rack can be used to carry up to 3 bikes. Simple and quick installation on the towbar ball. 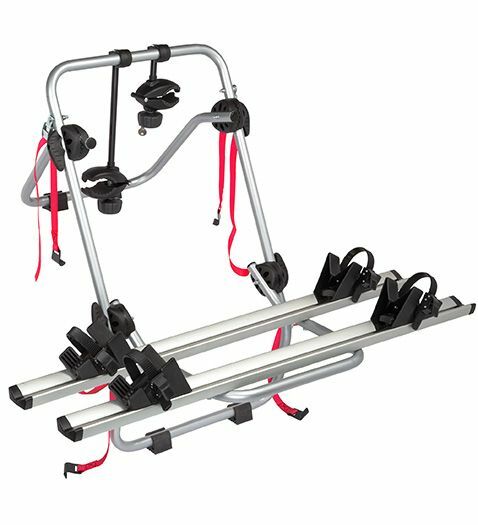 2 straps to stiffen the entire rack mounting provide additional attachment. Upon removal, you can fold it, to save space when stored in the car boot. 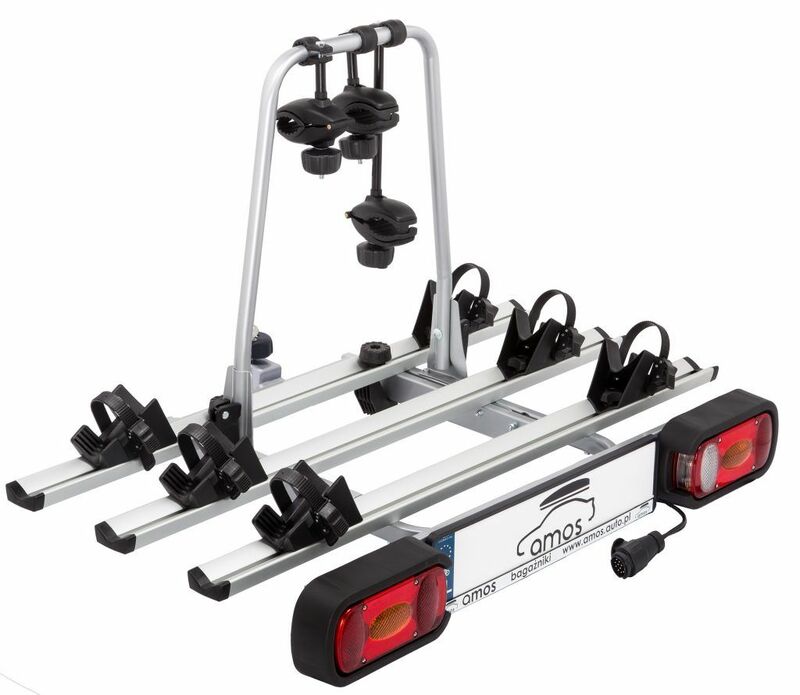 Bikes carried on this rack cover the rear lights and registration plate; hence, we suggest the optional purchase of a lighting board (light bar). 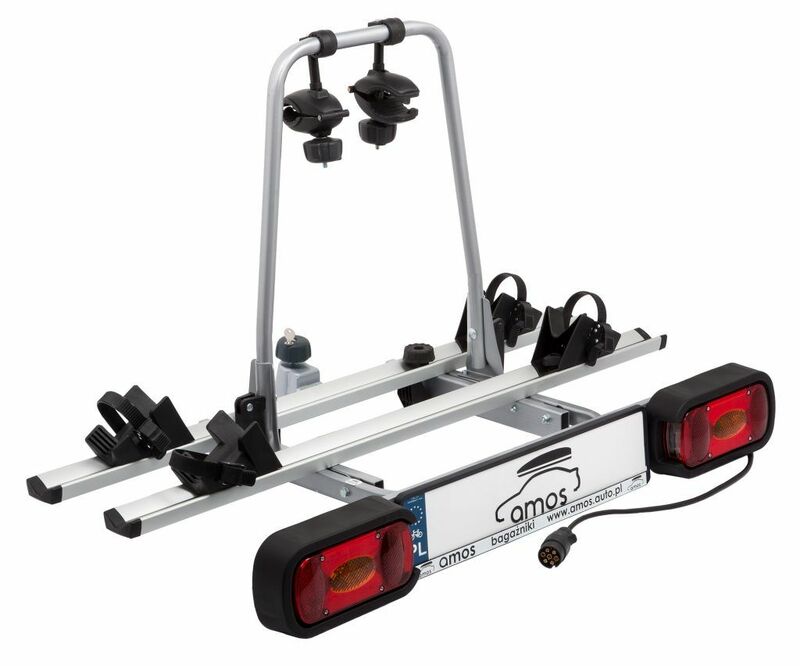 Install the lighting board on the extreme bike carrier and provides a holder for the third (additional) registration plate. ATTENTION! A greater amount of force may be required for the rack installation. 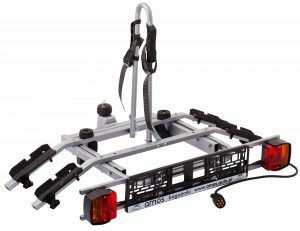 The TYTAN PLUS towbar-mounted platform is a very convenient design (both for the user and for the bikes carried). Mounting to the towbar ball only. It is possible to provide anti-theft protection with a padlock (included) which is secured with a mounting bolt. 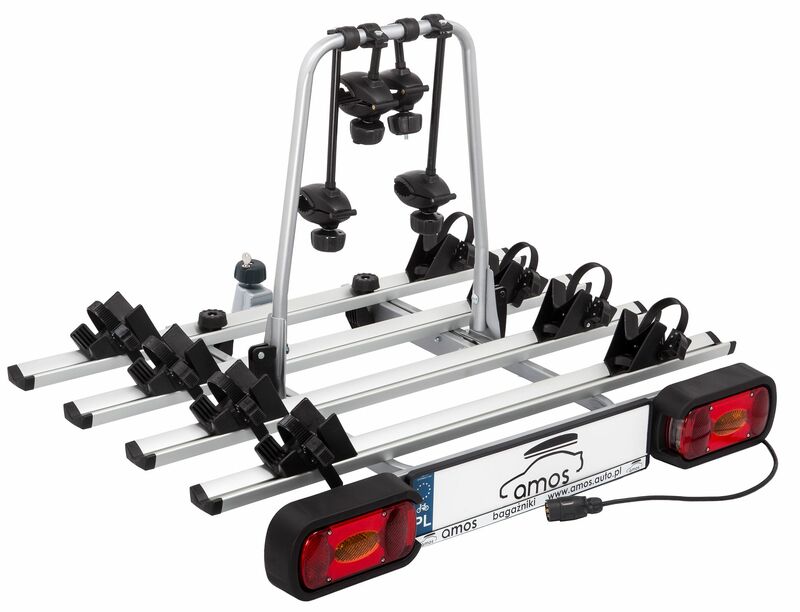 The set includes a lighting board (light bar) with a holder for the third (additional) registration plate. Prior to the purchase, check the maximum pressure on the towbar ball permitted by the towbar manufacturer. For cars with the spare wheel on their back (SUV), it will be necessary to remove the wheel or it will not be possible to carry the maximum number of bikes. The design also allows for carrying different loads (e.g. a mower), in compliance with the maximum load capacity; it is essential to secure the load as appropriate and it may not breach traffic regulations. 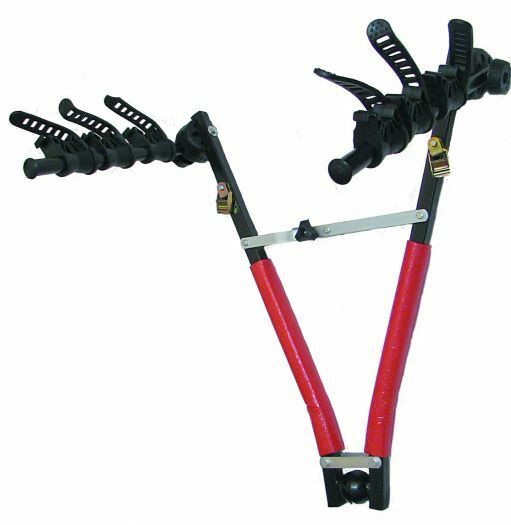 For bike transport, the set includes attachment straps (5 straps per bike). TYTAN PLUS platforms have a tilt function. You can lay, in a convenient and fast manner, the part of the Platform where bikes are fastened and open the boot (Notice – the tilt function does not work in every car e.g. all-terrain vehicles or delivery vans – especially if the tailgate hinges are not the side rather than at the top). TYTAN PLUS platforms have PIMOT and TUV certification! 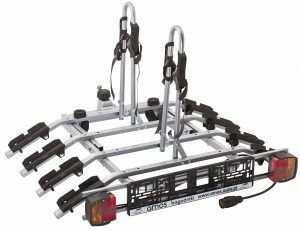 The GIRO towbar-mounted platform is a pretty and convenient design (both for the user and for the bikes carried). Mounting to the towbar ball only. It is possible to provide anti-theft protection with a padlock (included) which is secured with a mounting bolt. Bikes are protected against theft with locking knobs. Plug it into a 7-pin socket, just like a trailer. Straps for fastening of wheels (permanently attached to the base) with a convenient tightening buckle. GIRO platforms have a tilt function. You can lay, in a convenient and fast manner, the part of the Platform where bikes are fastened and open the boot (Notice – the tilt function does not work in every car e.g. all-terrain vehicles or delivery vans – especially if the tailgate hinges are not the side rather than at the top). Important changes concerning the third (additional) registration plate!! The changes are introduced with four ordinances: – of 9 September 2015 amending the Ordinance concerning the registration and marking of vehicles (Journal of Laws of 2015, item 1603); – of 24 August 2015 amending the Ordinance concerning the charges for issue of the registration book, temporary permit and registration plate (plates) of vehicles (Journal of Laws of 2015, item 1601); – of 24 August 2015 amending the Ordinance concerning the registration plate validation procedure as well as technical requirements and validation sticker models (Journal of Laws of 2015, item 1602); – of 3 November 2015 amending the Ordinance concerning the technical requirements for vehicles and scope of their required equipments (Journal. of Laws of 2015, item 1967). The Ordinances enter into force on 1 January 2016.